These tips from travel-savvy globetrotters will have you packing smarter, not harder on your next business trip. Blogger Jo Karnaghan advises “Don’t think in outfits.” You will take more, but paradoxically have less to wear. You will get more mileage if you pack a capsule wardrobe where everything goes with at least three-quarters of everything else. Jo avoids the pinstripe look – it’s limiting for evenings and weekends. Instead, she opts for softer bottoms, tops and dresses that transition to night with a change of jewellery. Jo recommends leaving the jacket at home and taking a cardigan – it’s easier to pack and carry, and there’s no creasing to care about. She says that with the right shoes and clothes, even a cardie can look professional. Turn suits inside out to prevent creasing. Accessories are a must. Choose things that are lightweight and small, such as a few scarves and some bright jewellery that can extend your wardrobe. Protect small but valuable and easily breakable things, like USB’s, chargers and jewellery, inside socks. Then put the socks inside your shoes. Instead of conscientiously lugging that gym gear that you may (or may not) use, just bring running shoes and go walking. Other packing-friendly options are resistance bands and a skipping rope. Check out the hotel pool or simply do yoga on the hotel room floor. 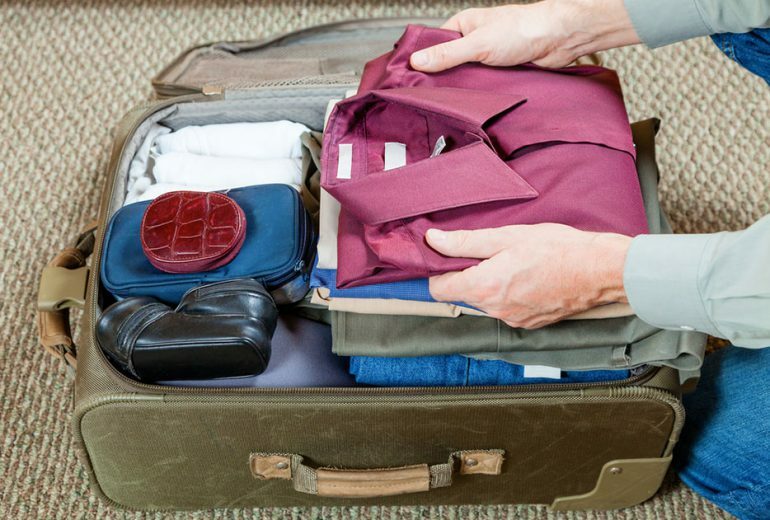 Pack at least one set of full business attire for your destination so at least your first work day won’t be disrupted if your luggage goes missing. Pack a second set of smalls like underwear and a second top or business shirt to take you into the second day. If you’re wearing comfy shoes, pack business shoes or vice versa. If your luggage is absent, you can’t live for days in business shoes, and you can’t go to meetings in your Converses. But only bring two pairs of shoes – no more. And don’t forget all your electronics in your carry-on, too. Email scans of all important paper documents like passports and insurance policies to yourself, so you can find them anywhere. In fact, businessman Jeffrey Davis never checks luggage at all, even on a four-week trip. The ease of being first through Customs and never waiting around for a bag will make you a true believer, he says. Best luggage? Davis recommends a roll-aboard with a hook that counterbalances your tote or briefcase. That way, you can walk a mile through the airport, free as a bird. After all, even a business trip is supposed to deliver the freedom of travel!